High-power transistors usually have low current gains, so relatively large base currents must flow into Q2 and Q3 to supply a high load current. This means that the quiescent current through Q1 must be large, and consequently resistor RC is small. The small value of RC keeps the amplifier voltage gain low. To improve on this situation, Darlington Connected Output Transistors may be used, as illustrated in Fig. 18-24(a). Transistors Q4 and Q5 in Fig. 18-24(a) are low-power devices that supply base current to output transistors Q2 and Q3, respectively. Note the four biasing diodes in Fig. 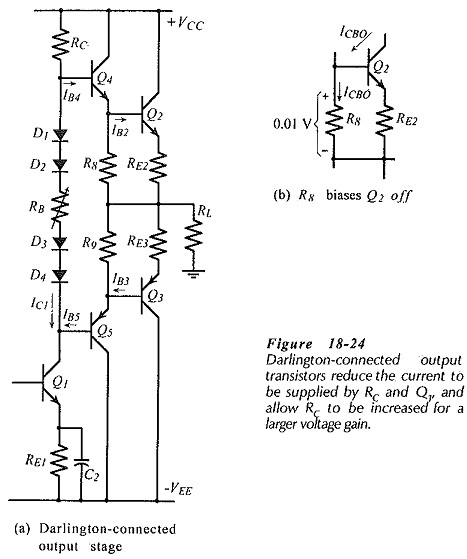 18-24(a) to bias the four transistor base-emitter junctions. This reduced base current allows IRC(min) to be smaller, giving a larger resistance for RC, and resulting in a larger voltage gain. The voltage drop across the resistors (ICBO R8) should be much smaller than the normal transistor base-emitter voltage. Selecting ICBO R8 equal to 0.01 V normally gives satisfactory resistor values. R8 and R9 are not required when power Darlington Connected Output Transistors are used.